A series of special events and activities are taking place across Adur in November to connect current and future generations with the lives, stories and impact of First World War. A symbolic oak tree will be planted in Buckingham Park, Shoreham, by councillor Joss Loader, Adur District Council chairman on Friday, November 9. This will involve pupils and staff from Buckingham Park School, with the year six pupils writing poems and prose from the perspective of front line soldiers, as well as from those who stayed behind. Cultural institutions will also be hosting events in the district. An exhibition at the Marlipins Museum in Shoreham High Street, called The First Great Silence, will run until Sunday, November 11. On Remembrance Sunday, November 11, services and parades will be held at the war memorials in Lancing, Shoreham, Sompting and Southwick. Councillors will be present to lay wreaths. Bells at churches such as St Mary de Haura are due to ring out freely after services are held. Read more about the new recruits in Shoreham learning the ancient art of bell ringing ahead of Armistice day. Councillor George Barton, Adur District Councillor and Armed Forces Champion, said: “The events next month are the culmination of a full year of events across the region to mark 100 years since the end of the First World War. In Worthing, a spectacular display of more than 4,000 hand-knitted poppies will be exhibited in front of the town hall in November, in remembrance of the lives lost during the war. On Monday, November 5, a total of 666 crosses will be in place ready for the opening of the Garden of Remembrance at Worthing Town Hall. 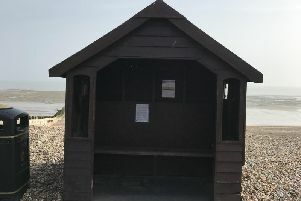 To commemorate the more than 600 Worthing men who lost their lives in the First World War, 666 individually-named poppy crosses and biographies will be displayed on the houses where the fallen had lived as residents before enlisting. Portraits of those who died are also being displayed on phone boxes. On Friday, November 9, a short memorial will take place and artwork will be unveiled at Worthing Station involving pupils from St Andrew’s School. Worthing Theatres will be hosting a programme of WW1 films at the Connaught Theatre. Worthing Museum and Art Gallery will also host special displays. Councillor Tom Wye, Worthing Borough Councillor and Armed Forces Champion, said: “These events will help us to remember the tragic loss of life during following two World Wars and other conflicts on the Centenary of the First World War.